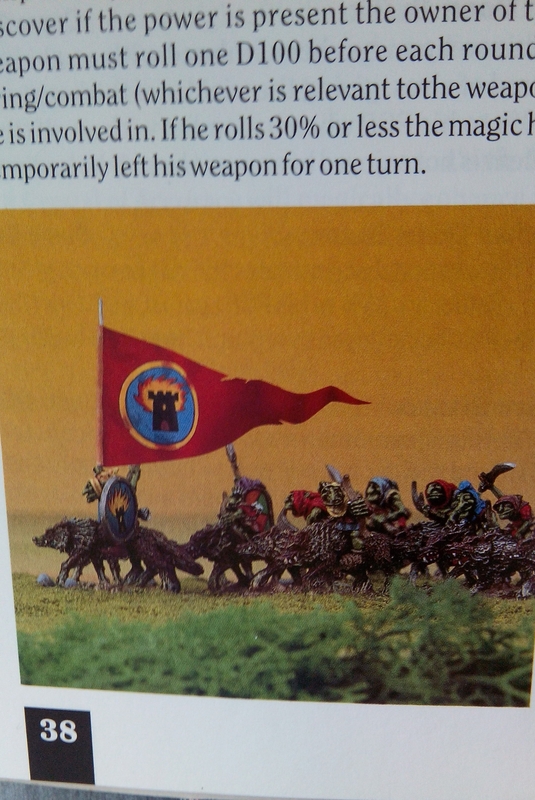 One of the ‘creations’ from AD&D that made it’s way into Warhammer Fantasy Battle (WFB) was the Half Orc. In WFB Orcs and Goblins raid Human settlements and take cattle and captives for food, often to take back to their homelands. It appears in the earlier editions though that Goblinoids weren’t as asexual as later incarnations and it was implied that some of the female captives suffered fates worse than death by Orcish cooking pot. Tolkien had Half Orcs in his stories of course but these creatures were created by Saruman to work as slaves and warriors for his own nefarious purposes. Tolkien’s stories aren’t known for their high copulation count so I think it’s fair to say he envisaged Saruman’s Half Orcs being manufactured by some sort of magical in vitro process rather than by the violation of women by Orcs. The Half Orc PC in 1st Ed AD&D typically became a bit of a one trick pony, the stereotypical fighter hampered by low intelligence and even lower charisma. They weren’t particularly liked by other PC races. They weren’t particularly liked by anyone. The Half Orcs of 1st and 2nd Ed WFB were also outsiders used to fighting against the world, unwelcome in both Orc or Human society. 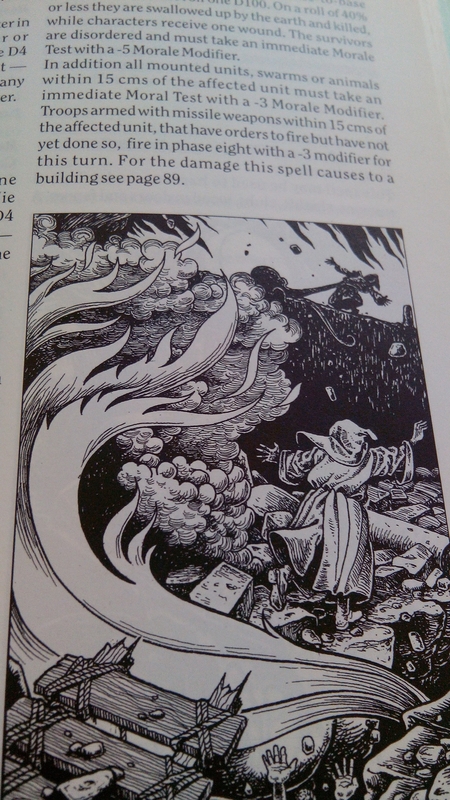 They formed Mercenary units like RR9 Regiments of Renown ‘Mudat’s Mercenary Half Orc Maniacs’ – incidentally the fluff for which includes the first possible mention of the city of Nuln, later detailed extensively in WFRP and later Editions of WFB. The Half Orc found itself relegated in 3rd Ed WFB. Small numbers were allowed in Orc and Goblin armies and they were still available as Mercenary units – I didn’t know anybody that used them and I never had any despite owning a large Orc and Goblin army at the time. Miniatures were still being produced, although nothing new was added to the range. By 4th Ed WFB they had completely disappeared, probably due as much to their unpopularity with players as to the uncomfortable back story of how they came into existence being too difficult to explain to the younger audience 4th Ed was aimed at. I always had a soft spot for them. The use of mercenaries seemed under explored in WFB at the time despite several of the Regiments of Renown being pay sword units. I think Half Orc mercenaries would be perfect in narrative based skirmish games and an uneasy alliance of Humans paying for their services against an Orc raiding party could have all sorts of twists and turns – not just financially but also possible intrigue from filial, agnate or cognate relationships. Here’s a Half Orc mounted on a pony quickly painted up as part of my ‘break from regiment painting’. The observant amongst you will notice that this isn’t in fact a Half Orc at all but was sold by Ral Partha/ Elmore Masterworks/Dark Sword Miniatures as a Chaos Warrior, originally mounted on a lizard. I bought it as I wanted to use the lizard for another project but the Chaos Warrior is very Goblinoid. The pony is from Citadel’s C33 Half Orc Hero set. 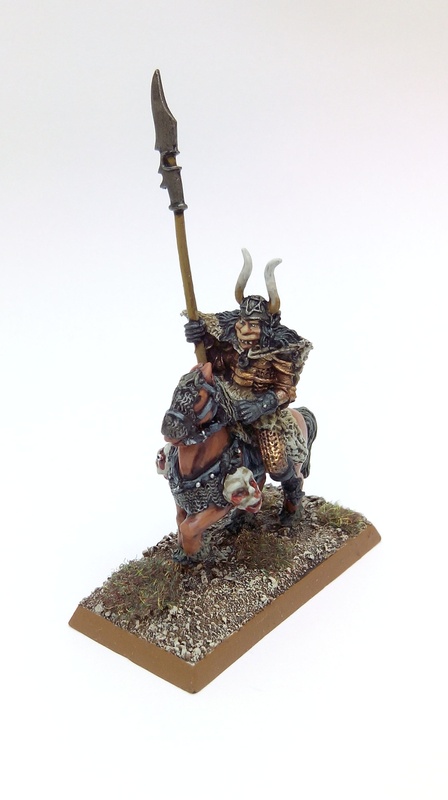 I bought the pony on it’s own cheaply to use with the Chaos Warrior rather than consign him to my bits box. 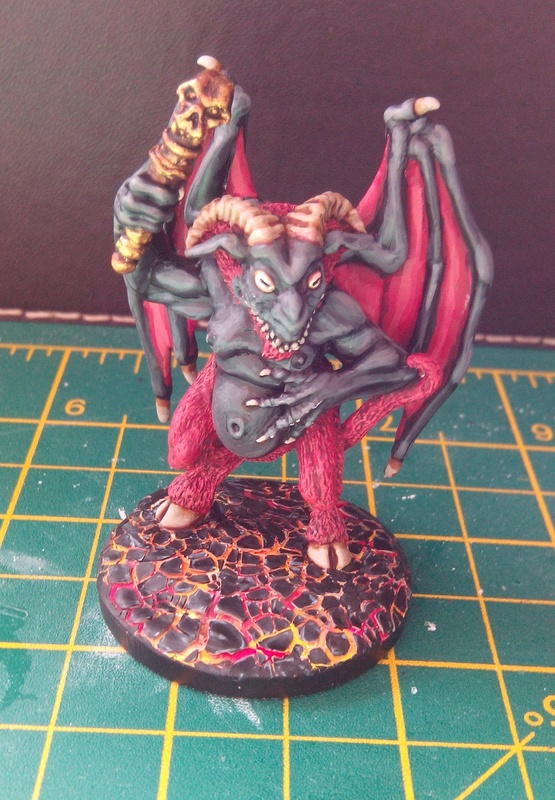 This entry was posted in Uncategorized and tagged AD&D, Citadel, Dark Sword Miniatures, Elmore Masterworks, Half Orc, Ral Partha, Warhammer on May 31, 2015 by Hobgoblin Orange. Nick Lund (Miniature Designer who’d worked for several manufacturers and was chiefly known for his distinctive style of Orcs, Trolls and Ogres) wrote Grenadier Miniature’s ‘Fantasy Warriors’. 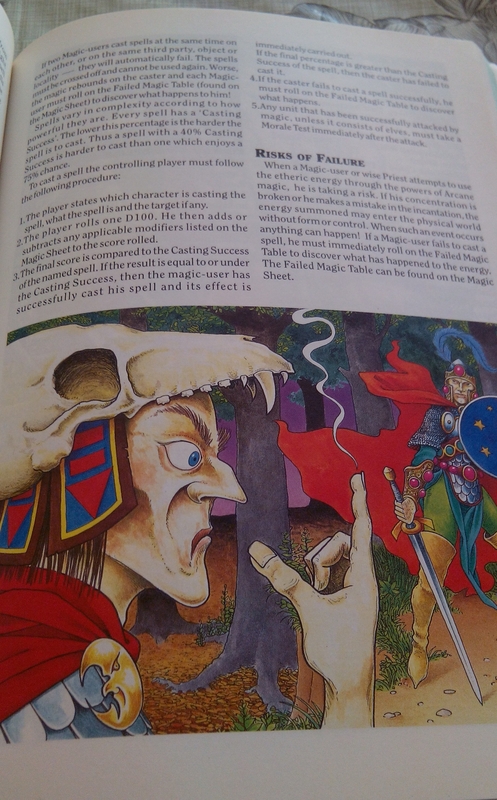 Gary Chalk (Illustrator, Model Maker, Writer and ex Games Development Manager for Games Workshop) and Ian Bailey (White Dwarf contributor, ex Head Buyer/Financial Director of Games Workshop) wrote Folio Work’s ‘Fantasy Warlord’. The latter of these two works was probably the least successful attempt from both a financial and gaming perspective to rival Warhammer so we’ll have a look at it. Fantasy Warlord saw publication in 1990. Due to poor reviews in the independent press it sat on retailer’s shelves collecting dust in droves for the next few years. At the time I was a Sales Consultant in a City Centre Games Store. Part of my job was buying the RPG, miniature and wargame stock. Fortunately I didn’t buy this product, the Store Manager did. The ten copies we had remained untouched until they were heavily discounted to get rid of them. Other retailers in the area told the same story. Despite it’s notoriety at the time I never read it and I doubt my gaming friends and colleagues ever did either. I’ve often wondered if the bad press it received was really justified. So I recently bought a copy off eBay for a quid and flipped through it to find out. This isn’t a review of the nitty gritty game mechanics but more of an overview of the book in general, to see what really happened and if it has anything to offer now. Here goes. All illustrations, photographs and text reproduced below from Fantasy Warlord are copyright of Gary Chalk and Ian Bailey and have been used without permission. It has been said that the cover illustration was garish and I have to admit it’s not the strongest of Chalk’s works. Beyond that my first impressions on flipping through were of a well presented professional offering. It’s a soft back A4 book with 192 pages plus reference sheets and templates. This was clearly aimed at the Fantasy wargamer who would have been playing Warhammer 3rd edition. The paper and printing quality are comparable to similar products of this period and from what I remember it retailed in the UK somewhere around the £10 to £13 mark. Time, effort and considerable money had been invested into it’s production. Further reading about it revealed that Gary Chalk apparently lost a considerable amount of money and suffered immense stress over it’s failure. The books starts out with a quick introduction to the usual mechanics of wargames – dice, scenery, what armies you would want to play etc before moving on to the rules. Combat uses a D100 instead of the ‘buckets of D6’ familiar to Warhammerists. Commanders issue orders to troops with differing morale classes using order counters. Magic Users can cast one spell at any point in the game turn as long as they aren’t attached to a unit in combat. Another note of interest is that there’s a whole section on character creation used to create characters to lead your army. There are skills and attribute tables for Warrior Heroes, Priests, Warrior Priests, Magic Users, Thieves and Discipline Masters. This seems very fantasy RPG, character classes were of course a part of just about every fantasy RPG at this point in time. The system does seem overly complicated but without actually playing it (which I have no plans to do) I can’t comment further on just how claggy it would become with several units in combat. Warhammer 3rd edition, well know as the worst version of that game from a playing perspective, does look rather easier to grasp. This game was a reaction to Games Workshop’s perceived ‘dumbing down’ of fantasy gaming. I’d like to know how many playtesters they involved in the process and the amount of market research done as no one seemed to have checked just how big a mature gamer market there was out there. The book is full of Chalk’s distinctive illustrations, mostly in black ink but with some colour plates. People who have ever read a White Dwarf pre issue 100 or Joe Dever’s Lone Wolf series would instantly recognize his work. A lot of these drawings are placed rather randomly within the book and often don’t actually relate to the adjoining text. Some are lifted from previous games that Chalk illustrated. 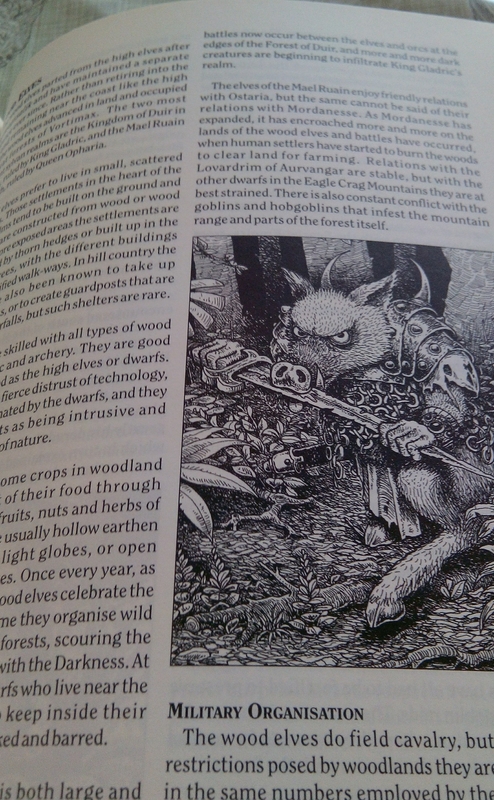 Illustrations of a Gorgaz (Lone Wolf) and a mounted Slann (Warhammer) are just two obvious examples, there are plenty more. Clarification of the rules are shown by photographs of actual miniatures on a wargames table in mocked up play. As these are purely for illustrating play situations most of these are a bit on the small size and in black and white so we can’t see the paint jobs. The photographs that are colour are mostly ‘staged battle shots’ and have some wonderful old miniatures well painted as you’d expect from Chalk. What I find do find strange is that a lot of the miniatures photographed for the book are made by Citadel, part of the very same company the authors, as apparently disgruntled ex employees, were trying to compete with. Alternative Armies had the rights to produce the official miniatures to this game so why weren’t they used from the start? I understand it would have been a limited range at the release of Fantasy Warlord but still, if you’re trying to compete wholesale with Games Workshop you wouldn’t put photographs of their products in your book. The second part of the book is an entire background for the game – Vortimax. This is 47 pages detailing the world and it’s inhabitants. All the standard fantasy races appear to be present with some incredible detail on the kingdoms of mankind. The world seems influenced by Lone Wolf’s Magnamund, Clark Ashton Smith’s Swords and Sorcery stories with hints of Warhammer around the time of Orc’s Drift and McDeath – before WFRP solidified the concept of the Empire as the major powerbase of mankind. This is a neat piece of work which I will be plundering ideas from to use in my own Swords and Sorcery RPG setting I’m sure. 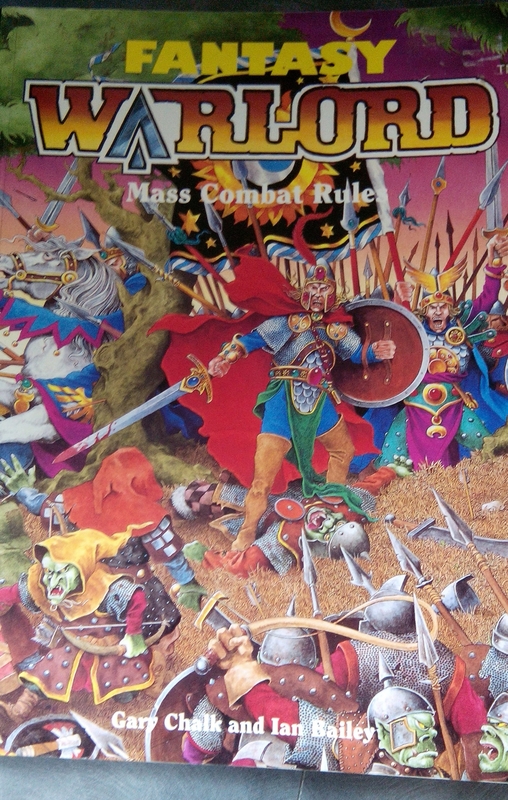 So in conclusion if this was 1990 and you had wanted to use Fantasy Warlord as your wargaming ‘go to’ or as an alternative to Warhammer you’d be disappointed. The reviews of it as a wargame were probably correct. I doubt anyone will ever want to play this game but as a piece of gaming nostalgia I would wholeheartedly recommend picking up a copy if you can find one cheaply. It’s rammed full of Chalk’s illustrations, has a few nicely painted miniature pics and more importantly has a mass of well written fluff that could easily be incorporated in to your own campaign – be that a wargame or an RPG. It certainly hadn’t been done on the cheap as a cynical cash in on Warhammer’s success, this was a real labour of love, albeit misplaced. So what happened to the authors? Last time I’d heard about Gary Chalk was in a wargames magazine in the late 90s before my gaming hiatus. He was living in France and making made to order wild west buildings. I decided to have a look what he’s up to now and it appears he’s still living in France and illustrating the latest versions of Runequest and Lone Wolf amongst other things. It’s good to see he’s still in the business. Ian Bailey seemed to go to ground after Fantasy Warlord and didn’t come up on my radar again. A quick Wikipedia search reveals he hasn’t really continued to be part of the gaming industry although has carved a successful career in other industries and educational posts. 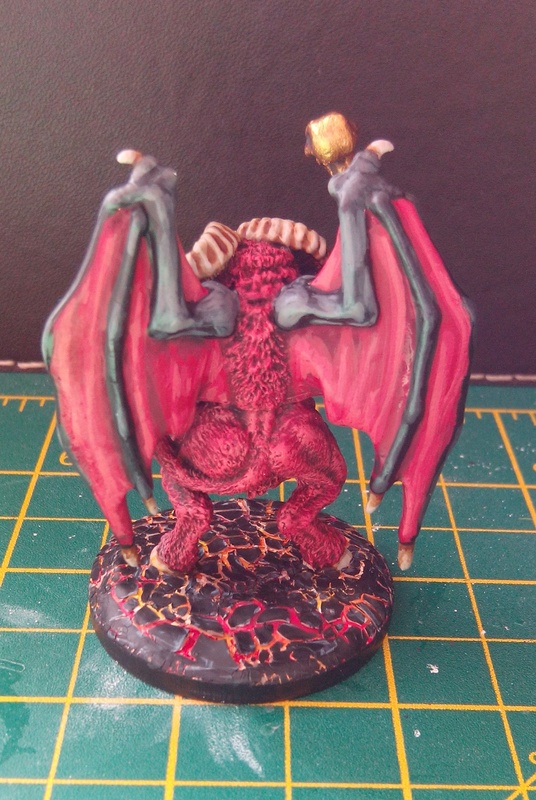 This entry was posted in 1985-1990, Post-1990 and tagged Fantasy Warlord, Folio Works, Gary Chalk, Grenadier, Ian Bailey, Nick Lund, Warhammer on May 26, 2015 by Hobgoblin Orange. Internet distraction disorder can be a real hindrance to getting anything worthwhile done. Just occasionally though the random tangents can lead to something truly interesting. This happened to me late last year while looking for inspiration for building fantasy scenery. By pure chance I stumbled across Alessandro Conti’s scratch built Necrons posted on the Matakishi’s Tea House site. It seems Alessandro’s models divided opinion when pictures were posted on Warhammer 40K forums about 7 years ago. I know very little about the Necrons. They weren’t in the 1st edition of W40K (which was the only version of the game I owned) and Wikipedia tells me they appeared as a new race towards the end of 2nd edition W40K’s lifecycle via an article in White Dwarf issue 216. Anyway, as noted above, Alessandro’s models didn’t suit everyone’s tastes. I can see why some people might have disliked them. They lack the detailed skeletal, anatomical finesse and metallic skulls that seem to visually define the Necrons. I don’t care that these creations didn’t meet a particular specification for some gamers. As generic, low technology robots I think they’re inspired! This got me thinking about creating my own and what I had of use lying around in toolboxes. After a quick search I was still short of parts. Luckily I remembered about a new store that’s opened nearby. It’s an independently owned ‘pound store’ that (unlike a lot of the bigger outlets doing this in the UK) stocks hundreds of cheap DIY items including hand tools, electrical components, plumbing supplies as well as the usual houseware, toiletries, etc. Most of this DIY gear is poor quality and looks like it wouldn’t really survive regular usage but that’s reflected in the price. Of course for my needs that made it perfect and I purchased the extras I needed. On top of the wire, rawl plugs, nuts, washers, cable clips and crimp connectors used in the original models I’ve also incorporated small rubber gaskets, plastic beads and fluorescent light tube starters in some of mine. As far as gaming I’d incorporate them into a 28mm Sci Fi skirmish game, which I’ll admit is unlikely to ever happen. Never mind, here’s the background I’ve envisaged for them. These individuals were originally agricultural robots on a distant colony. After severe dust storms devastated crops the settlers either starved or fled with only what they could carry on passing trader vessels. Decades later Religious Zealots/Pirates/Goblins have landed on the uninhabited planet, finding the robots in the ruins of the abandoned farmsteads. After hot wiring them into action again, the robots were crudely repaired and converted. Corroded panels were welded back on, damaged or safe mode circuits bypassed, leaky hydraulic cables cut down and reswaged to such an extent that the new owners managed to get these primitive mechanisms back into service – not as machines to farm with but as assault droids to quickly rip through the unsuspecting light infantry of any invaders. These machines have been patched back together haphazardly and as a result are unreliable and very dangerous. Not only have they had weapons attached which their circuits aren’t designed for, the new owners have also packed explosives into cavities in the bodywork. This can be triggered by remote control once they get amongst enemy troops or it might happen if the robots break down or suffer damage from enemy fire. Movement can be sporadic due to poor performance from elderly energy units and CPUs struggling to deal with programming conflicts created by patched up circuitry. 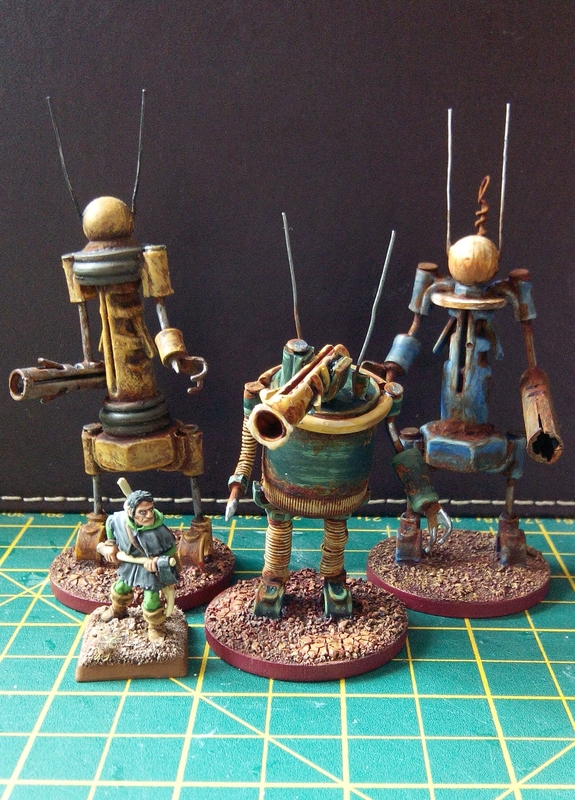 These robots really need to be followed by *ahem* ‘technicians’ to make minor ‘alterations’ as they approach the enemy – a quick tinkering with a 4lb club hammer can often work wonders. The technicians really need to keep up with the robots to stay in range to monitor/diagnose/repair. Of course this means that if a robot explodes then there’s a high probability the technician will be killed too if in range of the blast. The Locust TxH34 (pictured here with weapons not part of the factory fit) became a standard in agriculture for over 50 years, superseded by the later DxH44 and TxH54 models. Before conversion this was an Aardvark SZ253a, aimed at the far flung cash conscious colonist. With a performance comparable to higher priced units in the same range but without the added cost of extra features this was marketed as the most reliable robot ever, repairable in the field with even the most basic of toolkits. The Locust GR5000 was considered a combination of the best elements from both the DxH and TxH ranges until it too was replaced by later advancements. Again this one carries armament that would invalidate the manufacturer’s warranty. This group shot includes Rookbrow to give a sense of scale. 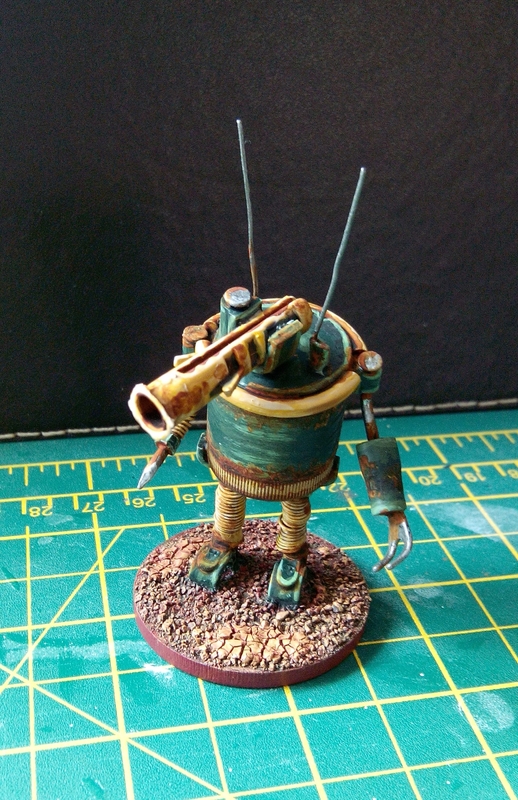 This entry was posted in Uncategorized and tagged Sci Fi, Scratch built on May 19, 2015 by Hobgoblin Orange. 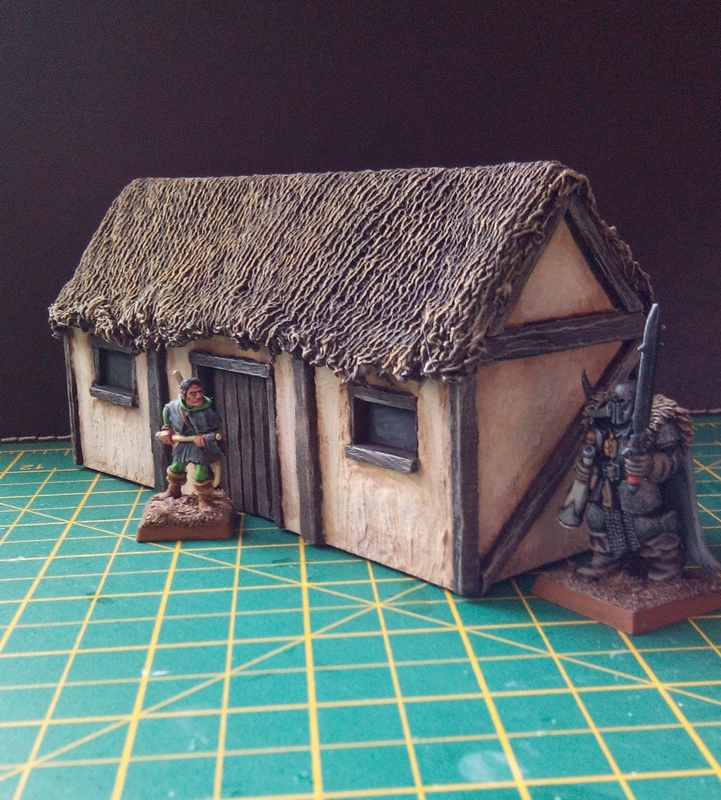 Many years ago I built enough 28mm buildings to make a small hamlet. It comprised several multi storey houses, a large inn, a barn/workshop and stables. 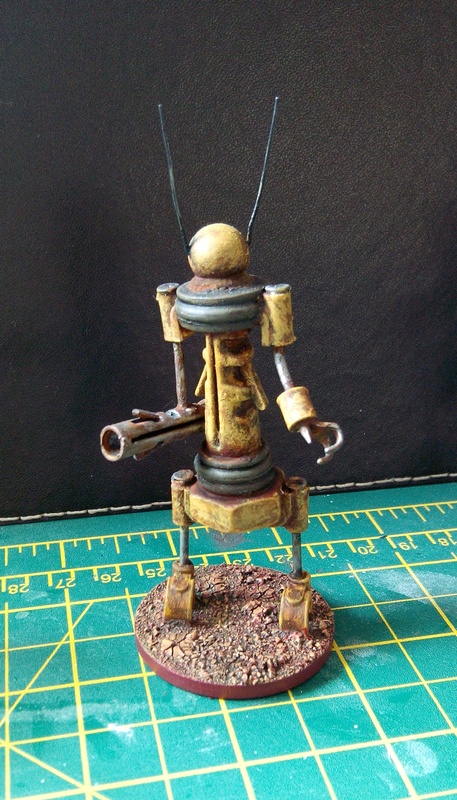 The basis for these came from inspiration from modelling articles in White Dwarf magazine in the early 90s. I no longer own copies of these magazines so I can’t remember the exact issues they appeared in (between numbers 140 and 160?) or even who authored the articles but I thought I’d give it another go at making a building but this time pretty much from memory. The most important thing I can remember was getting the scale to feel right, particularly for the windows and doors. Even within 28mm figures there’s a big difference between ‘standard’ human miniatures and the more ‘heroic’ humans that represent chaos warriors etc. My personal preference was to get a balance between the two so they looked okay with both sizes of miniatures. 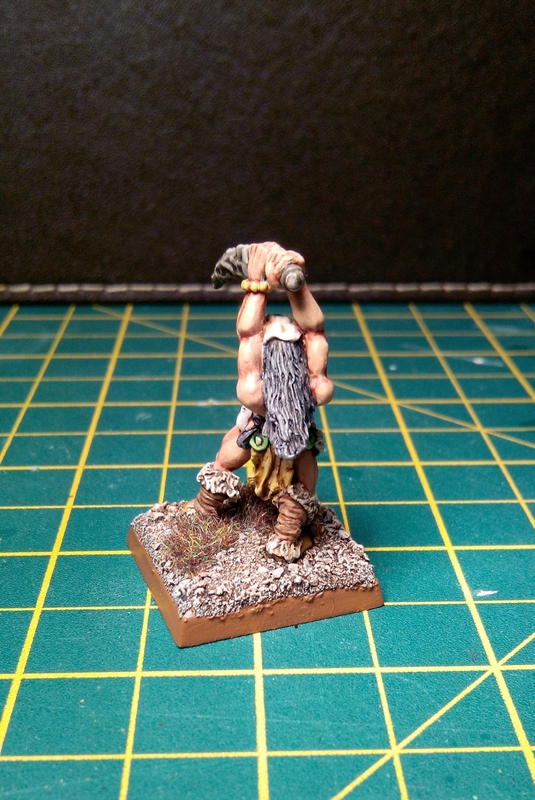 I used to use 2 particular figures as scale gauges when experimenting with this – a ranger figure and a chaos warrior. The original 2 I used are long gone so I’ve chosen similar models from my current collection. Remember this isn’t military or railway modelling made to an exacting scale, it’s all about things ‘feeling right’. The tools used to make this were standard model makers fare – a sharp knife, mechanical pencil and a metal safety ruler. I used a glue gun to secure the walls and roof panels together because I now own a cheap one but PVA glue left overnight to dry does the same job, just make sure the parts you are gluing don’t move. PVA was used to glue the woodwork on. In addition to standard acrylic paints a cheap matt black car aerosol paint was used on the roof, but more on that later. On completion I varnished it with a matt acrylic spray. really a problem but it can make windows seem a little bit ‘too deep’ and sunken. This can be remedied with adding a panel of card the size of the window inside the frame to bring the depth down slightly. The woodwork is a mixture of balsa and matchsticks. These look better if you shave small amounts off the edges of the wood to give the appearance of aged hand hewn timbers. Don’t go too mad though. The texture on the walls is ready mixed all purpose filler diluted down with water and applied to the foam card between the wood framework. 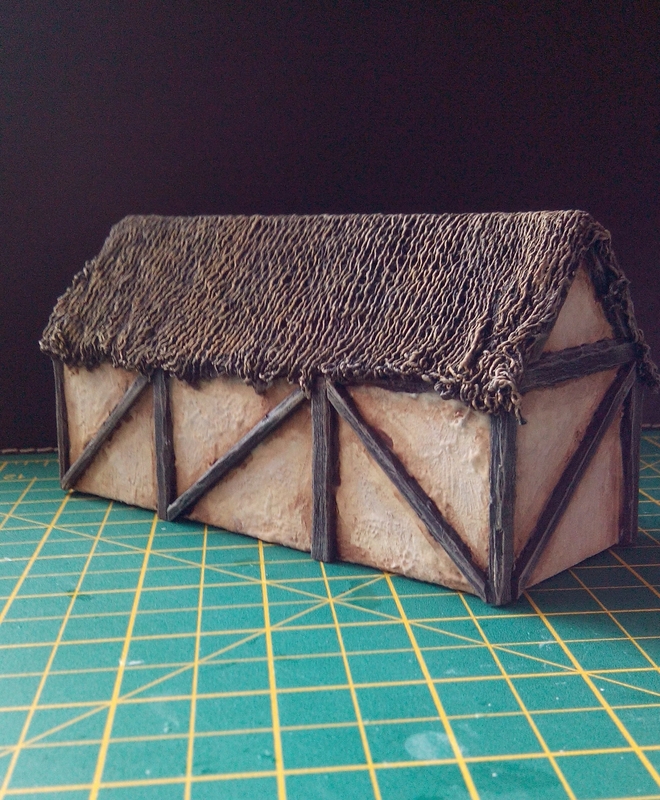 The roof first had fairly rigid card sheets (approximately 2mm thick) glued on to form a surface to apply the roof effect. All my previous buildings had tiled roofs which is achieved by using thin card (cereal packets are ideal) cut into strips with tiles cut into them. These are glued from the bottom up, overlapping each other to create the impression of tiles. It helps to break up the uniformity of these by cutting the occasional tile off at an angle as if broken and sheared off. Again, don’t go too mad. The top ridge is finished with a single piece of card with tile shapes cut on both sides to imitate coping tiles. 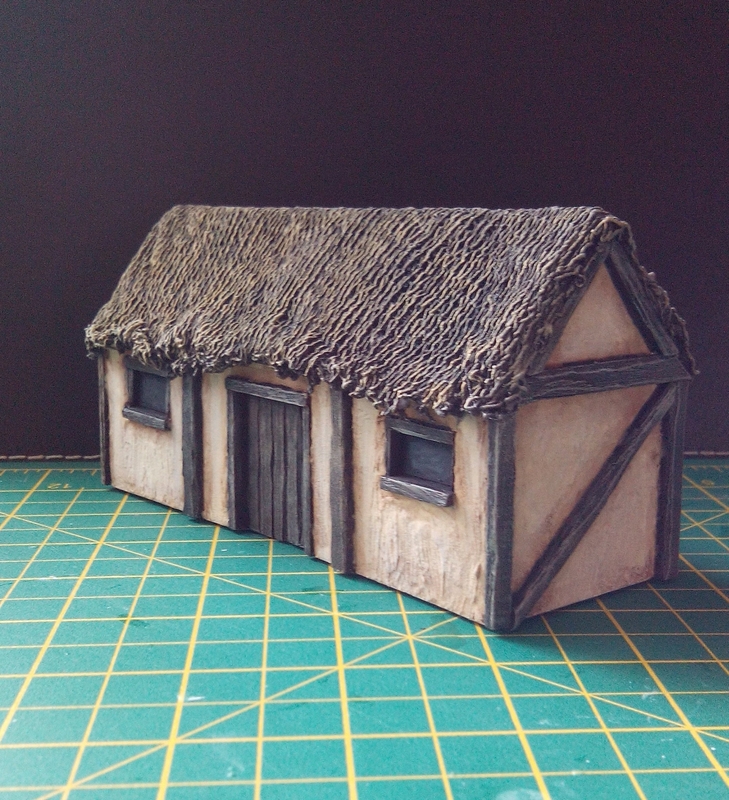 As this new building was to be a peasant hovel I decided to experiment creating a thatched roof. With no towelling material to hand I soaked a piece of cheap dish cloth in diluted PVA glue and draped it over the roof. I’m not entirely happy with this result but it does the job. 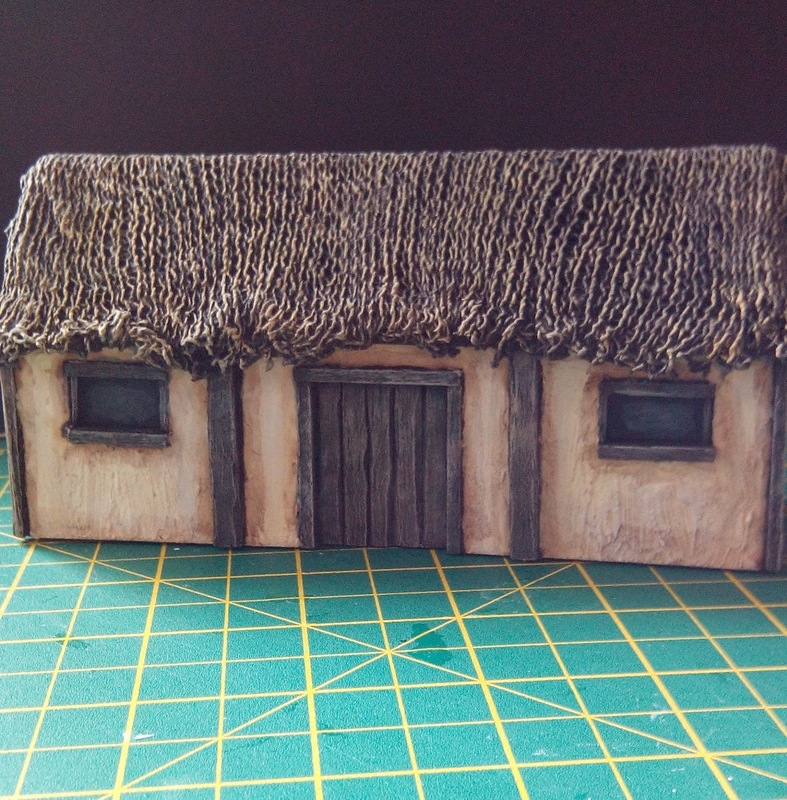 Next time I’d be tempted to add more pieces of dish cloth over the original piece to improve the thatch effect. You need to wait until the roof has fully dried out before you attempt to paint it. Mine took a good few days to dry. The woodwork was first painted with dark brown and then dry brushed using a pale grey brown and an off white bone/cream final highlight. The window panes were painted black with small amounts of grey added to the middle. For the roof I originally made a dark brown wash from some cheap tubes of acrylics I’d bought in a discount store. I applied this and although I was happy with the colour you could still see small dots of white card underneath on the roof where the paint hadn’t managed to penetrate through the dish cloth holes. This created a speckled effect and looked awful. To get round this I had to mask off the model and spray the roof with a cheap matt black aerosol. I then dry brushed it with dark brown and highlighted it further adding yellow and white to the original brown. Speckle problem solved. The wall panels were first painted with an off white bone/cream colour. A diluted pale brown was then washed around the edges of each panel leaving the middle untouched. When dry the middle was dry brushed with white. This next photo gives an idea of scale. 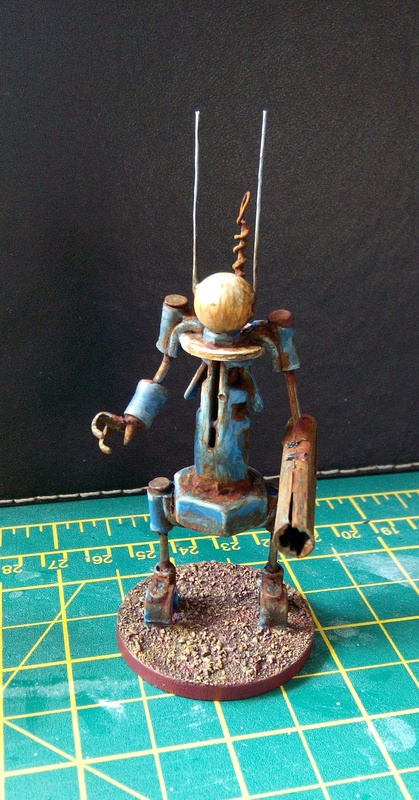 This entry was posted in Uncategorized and tagged Scratch built, White Dwarf on May 18, 2015 by Hobgoblin Orange.